Before you can enjoy this keyboard, you have to set things up. This board requires a USB port, which is not a problem with newer systems. Just plug in the device and let Windows find it for you. But because of this device’s extra features and buttons, you’ll have to install the included software to make full use of your new keyboard. This takes only a couple of minutes, though, and is well worth doing. You can use the board’s basic features without the software, but why stick with that when you have these other, neat capabilities? Like so many other ergonomic keyboards, the Natural 4000 has a fixed, split board. The keys are large enough for even fatter fingers and are very easy to reach. When you rest your index fingers on the home row keys, your elbows will poke out slightly. This is one of the most comfortable typing positions we can adopt – so getting into this typing stance by default is a great relief. This board also comes with a removable piece of plastic that snaps into the front side of the board. This raises the entire front edge, which makes some typists more comfortable. However, this piece is very easy to remove if you’re not interested. You also get the typical prongs on the back side for elevating that part of the board. These prongs are fairly sturdy, which isn’t always the case with other boards. Another nice feature is the large, padded wrist rest. Though proper typing position elevates your wrists above the board, this is a comfortable place to rest the heels of your hands when you’re taking a break. But those are just the basic features of the Natural 4000. The added, special touches really make this keyboard worth the retail price. The top row is full of buttons to control everything from music to the Windows Calculator. You can check your e-mail, control your computer’s volume and more. The five buttons in the middle are programmable. Install the software that came with the keyboard and you can assign each button its own task. If you’re surfing the Internet, there are “Back” and “Forward” keys between your wrists for your convenience. Another great addition is the slider between the two halves of the keyboard. This lets you zoom or pan out, which is perfect in your word processor and image-manipulation program. You don’t have to use the mouse at all, or switch to the program’s zoom function: just push the slider to make your adjustments. The big question, though, is “How durable is this thing?” There is no point in investing sixty to eighty dollars in a keyboard that will fail in several months. The good news is that, as long as you keep the board clean and avoid spills, you can expect a long life. You might notice that some of the most-used keys lose their letters, but that’s not a problem for touch typists. Another small wear issue is the fact that the tops of the keys become shinier and smoother with lots of use. These things, however, are true of most keyboards on the market. 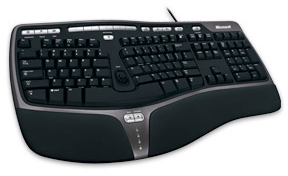 This keyboard is relatively small despite being an ergonomic model. Available in black with silver trim, this board looks stylish with just about any system you might own. You can pick up your very own Natural 4000 at most computer stores or online shops.